Finding a quick dinner after 9:oo PM isn’t always easy. The choices are pretty limited to fast food or pizza. I was out in search of something..anything to eat after a couple hours of work. I stopped first at a gas station that has chicken, but they were done selling it for the day. I headed down the street driving somewhat aimlessly thinking if nothing else, I’ll end up at the Chicken Coop on Sprinkle. Before I got that far, I came across a Little Caesars on Cork Street about a block west of Lovers Lane. I had actually thought about just going home and cooking a Jack’s, but this sounded better. No cooking for me. I made a quick left hand turn in to the parking of the building which is oddly connected to a string of buildings that really don’t look like they belong together. 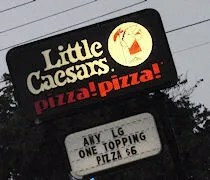 The Little Caesars is on the corner and, like most Little Caesars restaurants, it’s a take out only. During peak hours, you have a somewhat decent selection when it comes to Hot-N-Ready pizzas. 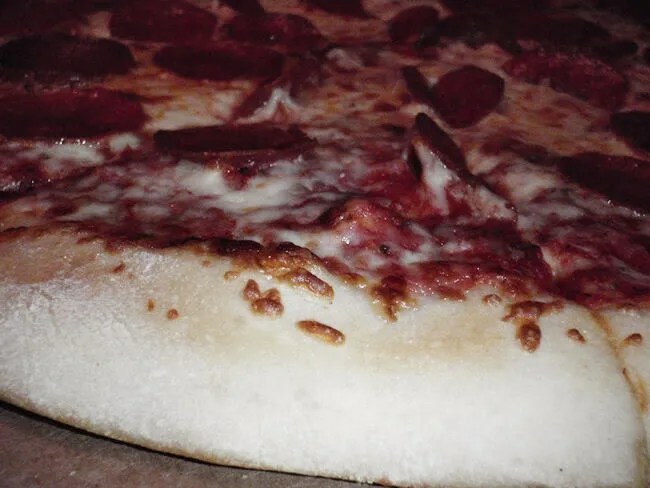 During off peak hours, your choices are pepperoni. That’s fine with me. I was eating alone and pepperoni is my pizza of choice. The clerk offered up some Crazy Bread, but I didn’t need it. I just needed a pizza. He grabbed one from the warming shelf and rung it up. It’s been a while since I’ve picked up Little Caesars. J and I would get them every so often in Lansing and they were always $5. The price has gone up a little to $5.55, but that’s still almost cheaper than you can buy a frozen pizza for at the grocery store if they’re not on sale. I have one of those love/hate relationships with Little Caesars. As a White Sox fan, I know my $5 is going to the Detroit Tigers. That hurts a little, but that’s not really the issue. The pizza itself is alright. It’s not my favorite pizza in the world, but it is my favorite $5 pizza. How can you complain about a $5 pizza? 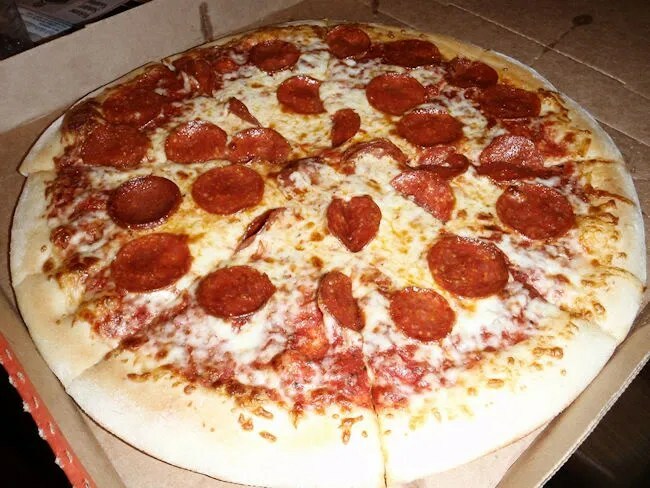 Whenever we make the choice to go to Little Caesars, it’s not because we want the pizza. We go because it’s quick, cheap, and it tastes alright. That was my deal tonight. I really didn’t want to end up at McDonald’s and I didn’t want to spend the twenty minutes cooking a frozen pizza. Little Caesars solves both problems. I really think the only reason Denny’s, Big Boy, Steak Shake and etc stays survies is they are the only places to get food that is not fast food or pizza. If you want dinner or breakfast in the middle of the night, where do you go besides Denny’s, Big Boy, Steak Shake? yeah…I’m kind of disappointed Kalamazoo doesn’t have any 24 hour local joints. I don’ t mind Steak ‘n Shake, but I haven’t been to a Denny’s in several years…Big Boy..it was interesting when we first moved to Michigan because there were non in Illinois, but that’s wore off. 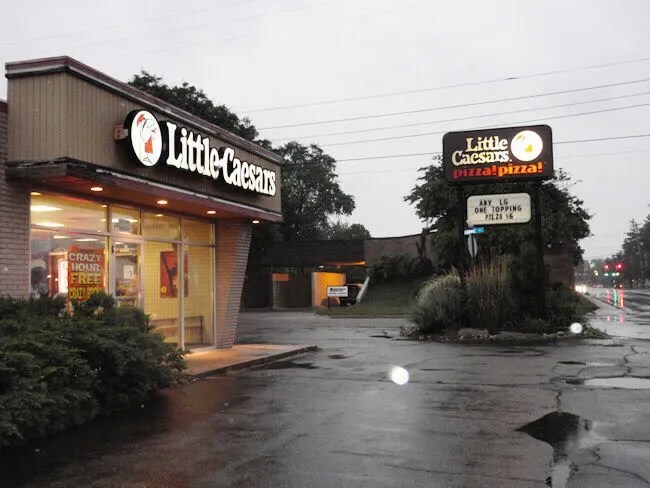 This particular Little Caesars on Cork St. near Lovers Lane made us 14 excellent pizzas (on a Little Caesars scale), the best crazy bread I’ve ever had at a Little Caesars, and were friendly and helpful. Highly recommended for cheap pizza.